It was a weekend of wild ups and downs. Cold rain. Steep, slick tracks. Mechanicals. Delays. It was all of these things combined that made this race one of the most taxing in recent memory. 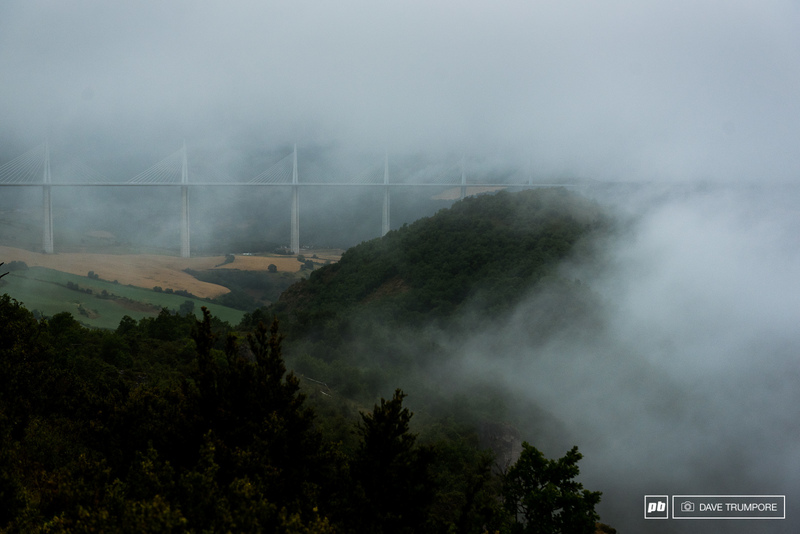 The raw terrain of Millau kept people on their toes, especially when the rains really started coming down. 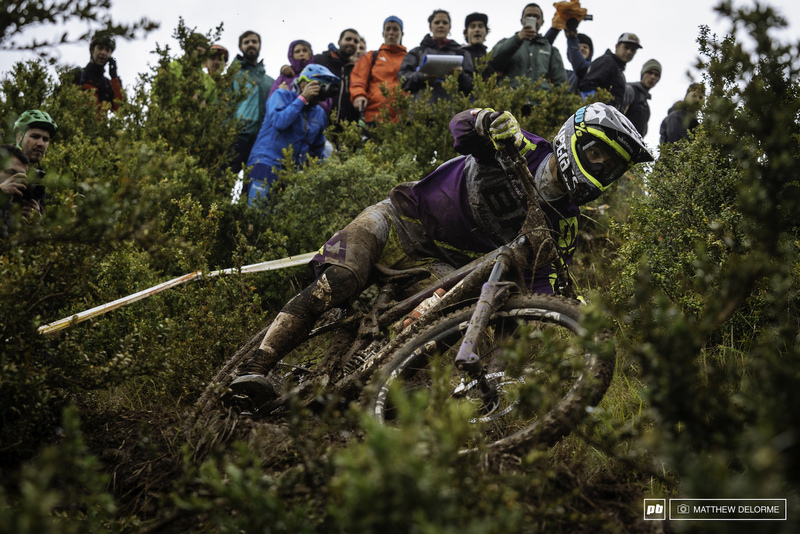 Slick narrow chutes became treacherous, the injuries started accumulating. 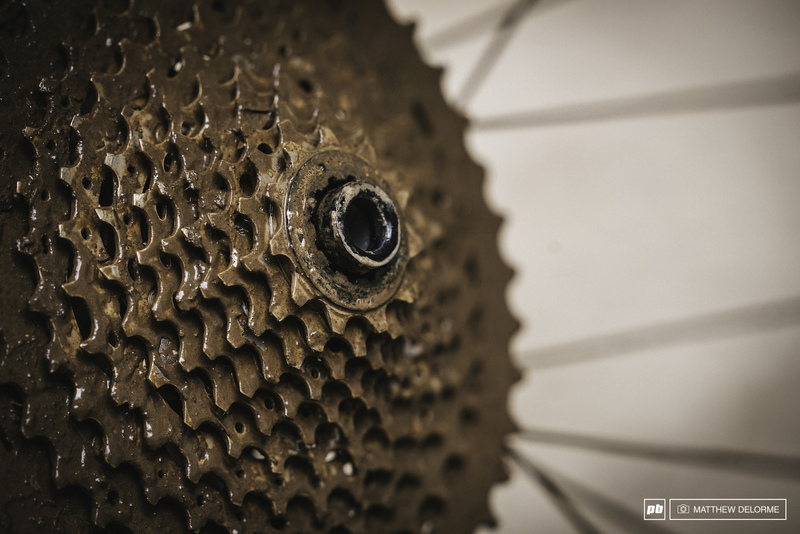 Bike parts started failing. There was a fair amount of riders who didn't start day two after day one. We thought we might get a bit of a break from the wet last night as we went to bed, but we awoke to low-hanging dark clouds. 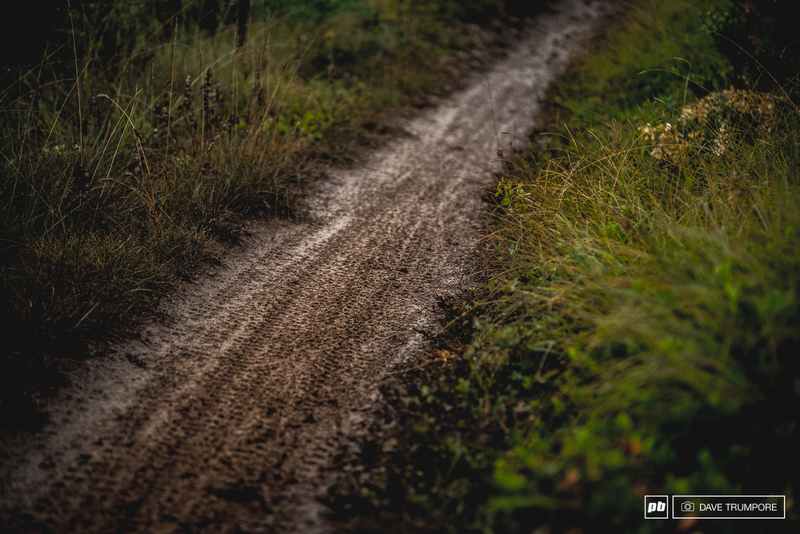 By the time we got to the top of the hill it was raining hard, and the clay-like dirt had become greased lightning. Rae Morrison slipped a wheel on the sprint out of the gate on stage 6 which ended her day. At the end of the day, we had a French sweep of the podium for the men and two out of three for the women. 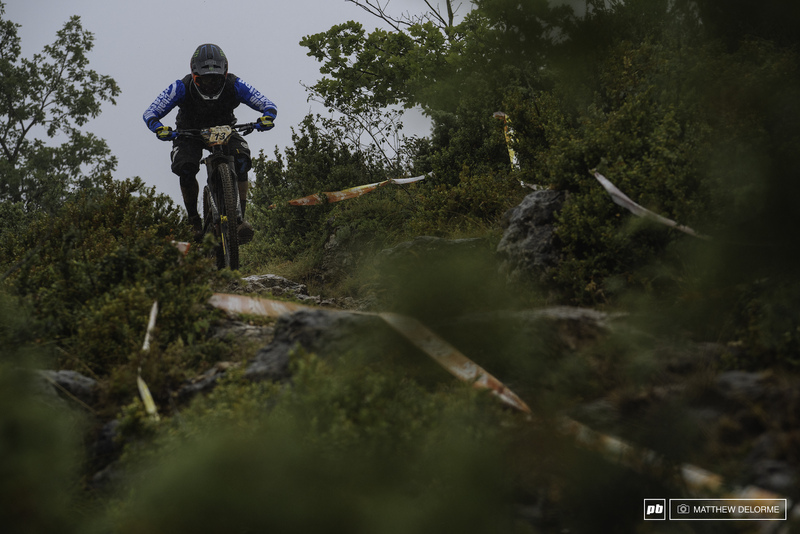 Sam Hill tried hard to find his rhythm of the French terrain. He made up time, but it wasn't enough. Greg Callaghan, with the series overall lead, struggled to come to terms with the tracks, and would ultimately give up his series lead. The big winners of the day were Adrien Dailly and Alex Cure. 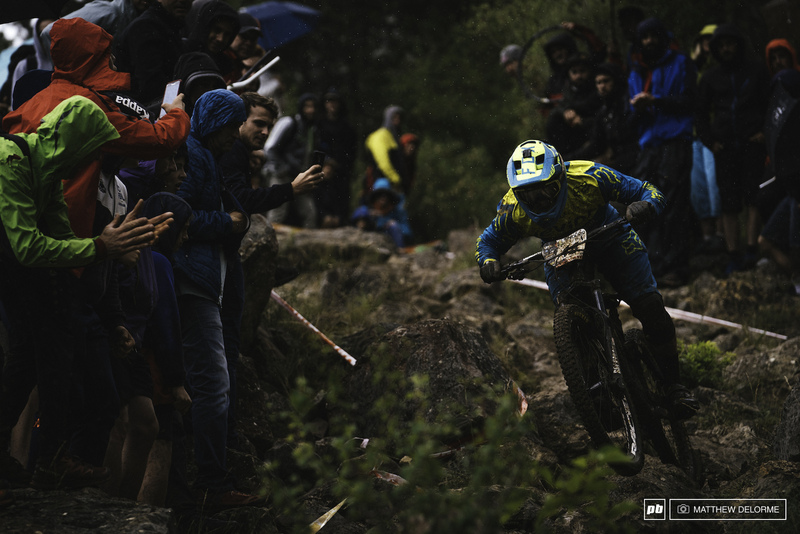 Alex had won the first ever EWS stage, a prolog. Today he took second place. 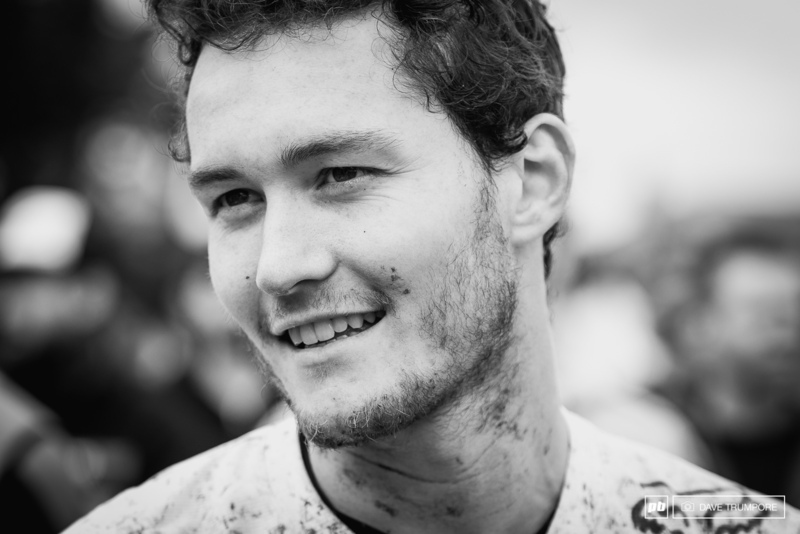 Damien Oton was charging all weekend and took third. Cécile Ravenel. 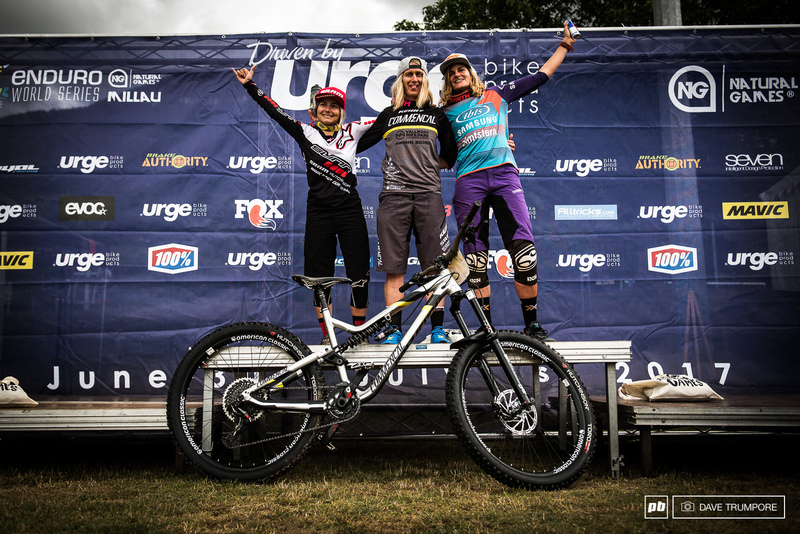 took the win for the women with Isabeau Courdurier and Anita Gehrig rounding out second and third. There were a fair number of penalties handed out over the weekend, and some not handed out because of lack of proof, the biggest issue of all was littering. Some riders thought it not fair for a penalty to be enforced at one race but not another. It's one of those things that will be watched closely the next couple rounds. 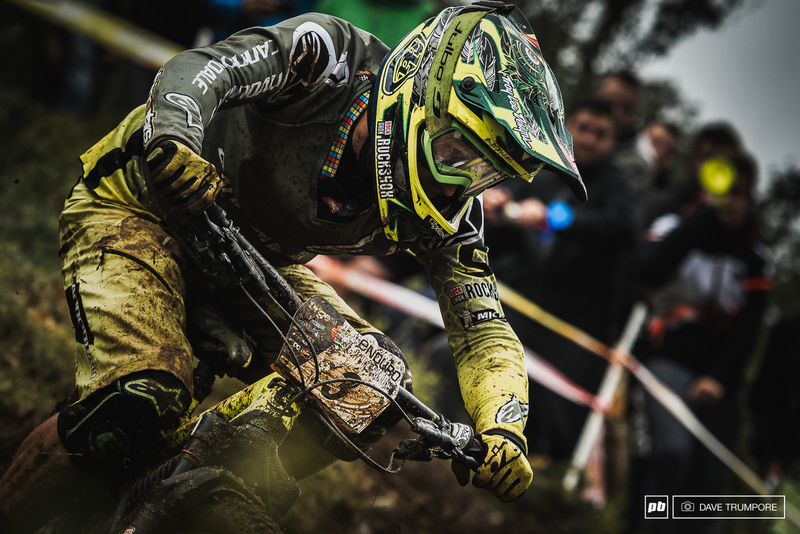 Adrien Dailly was the man of the weekend taking his third win of the season and the overall. After a rough day yesterday, Richie Rude was optimistic about turning things around as he left the pits this morning. Another day of rain left the oil slick flowing in full force. This has become the usual setup for covering the EWS this season. Is this all we are ever going to get? Jacob Gibbons was thrilled about the weather this morning. Anita Gehrig rounded out the podium in 3rd. 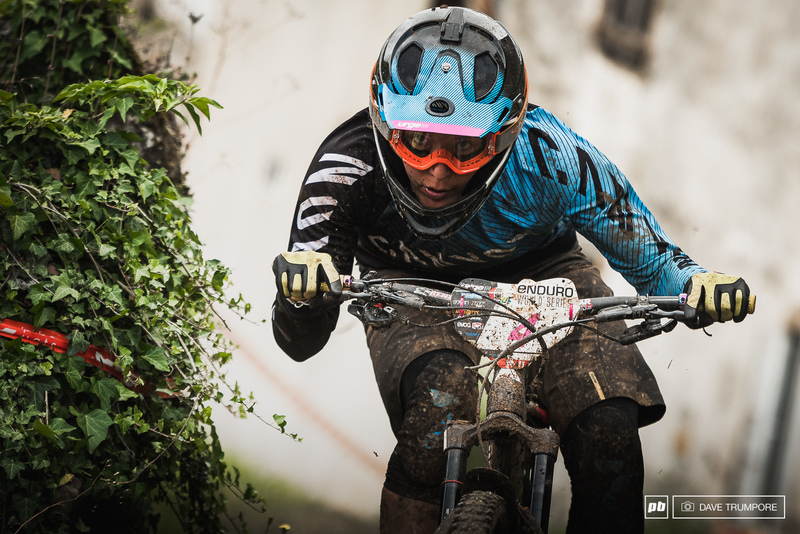 ALN was 4th and just off the podium in her second EWS of the season. Cecile Ravenel. was all focus in the rocks. 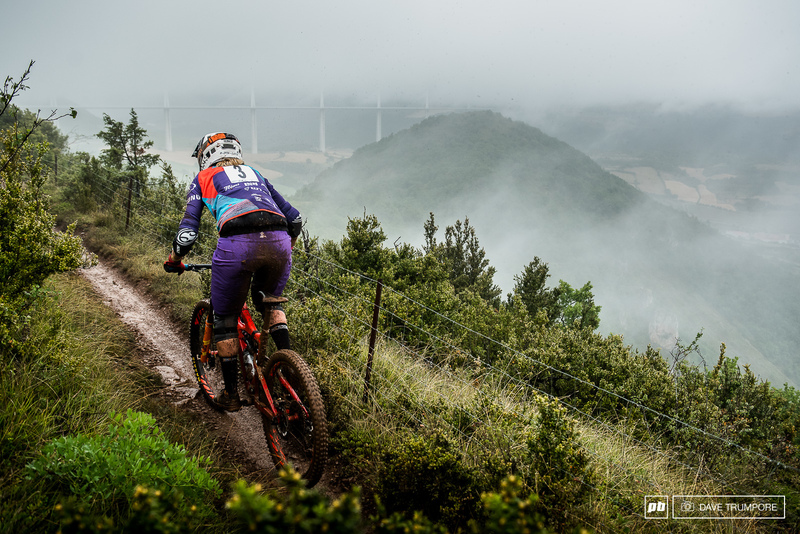 Bex Baraona drops out of the fog on stage 6. Theo Galy charging through the rocks on stage eight. 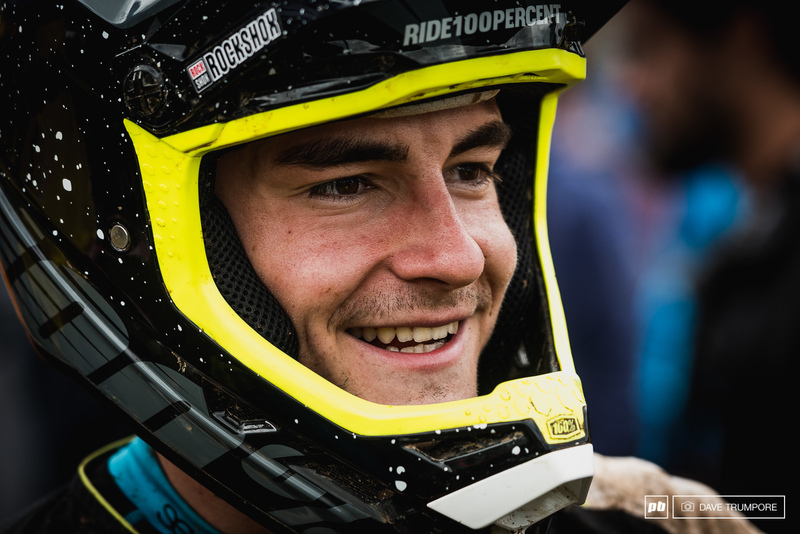 Theo rode to fifth place on the weekend. Adrien Dailly was the man to beat, but no one seemed up to the task. 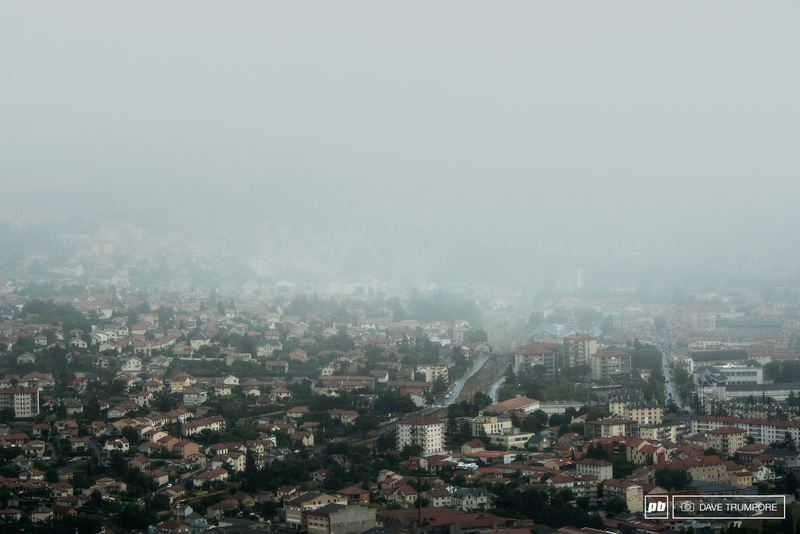 Fog and rain hug over the city as racers headed up the high ridge lines and the start of stage 7. 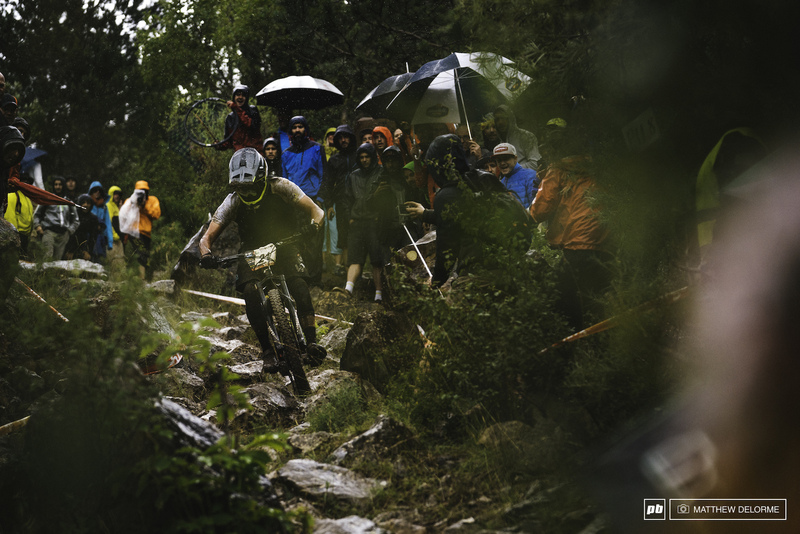 The slick switchbacks got the best of Jerome Clementz this weekend. Always full gas from Marco Osbourne. 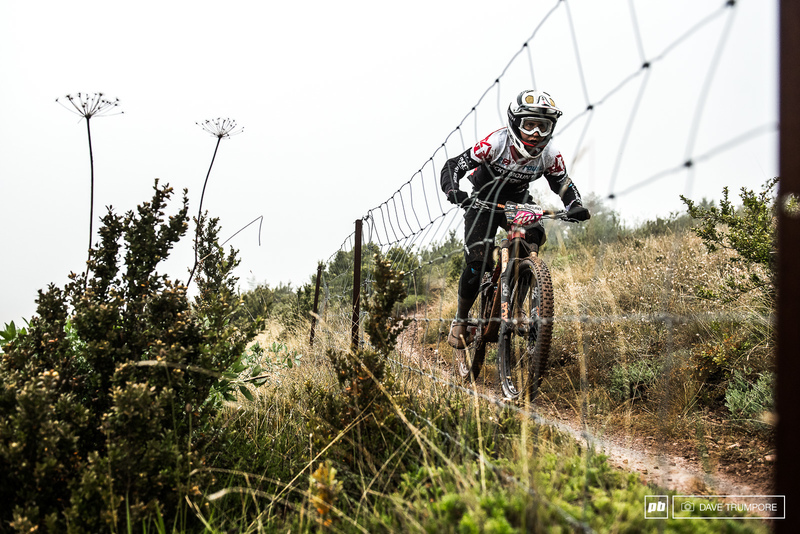 Isabeau Courdurier rode flat out and aggressive to take 2nd in Millau. A bit of a disappointing weekend would see Greg Callaghan lose his lead in the overall points chase. 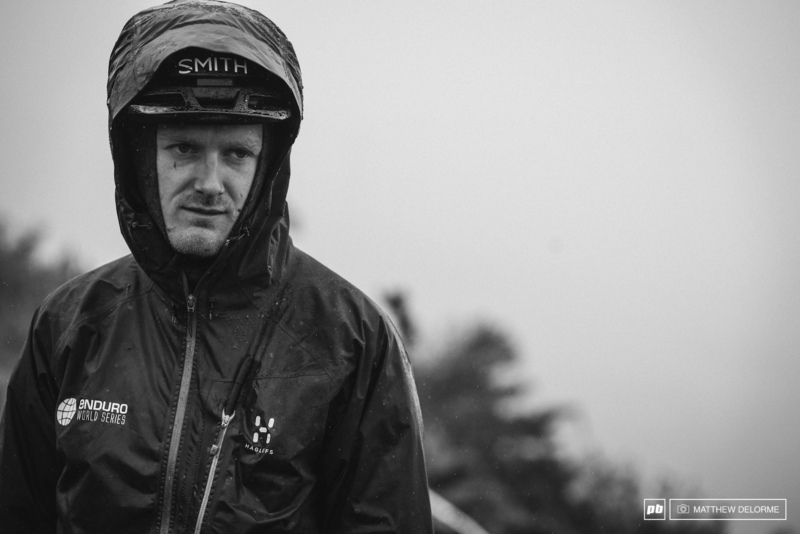 Sam Hill was making up time out there but it wasn't quite enough. Sam finished sixth in the slop. Wet. It's what we have come to expect. 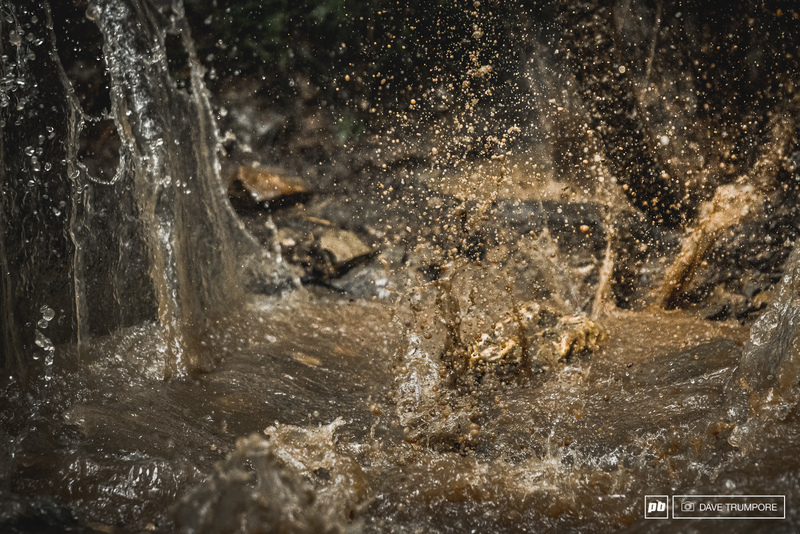 Once again the forecast was for a one hundred percent chance of getting very wet. Cecile Ravanel once again left the other women in her wake this weekend. Caro Gehrig gets ready to slip and slide down stage 6. 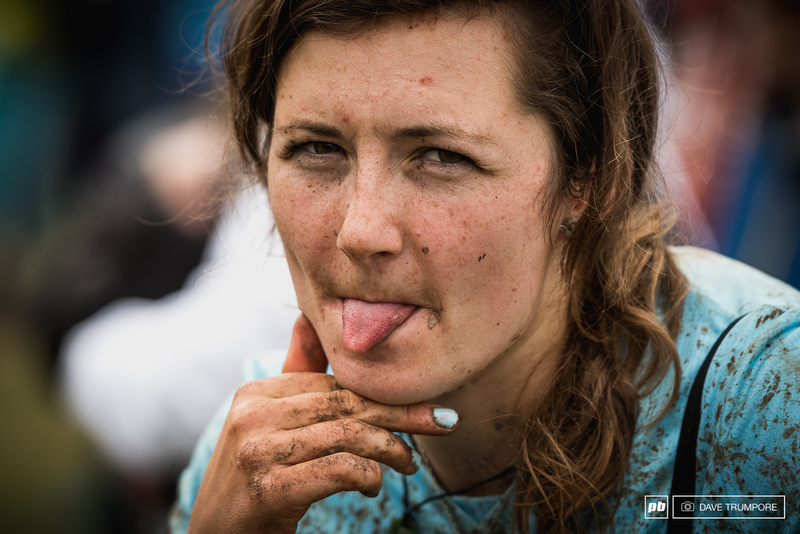 Katy Winton had a heartbreaking setback on the final stage. 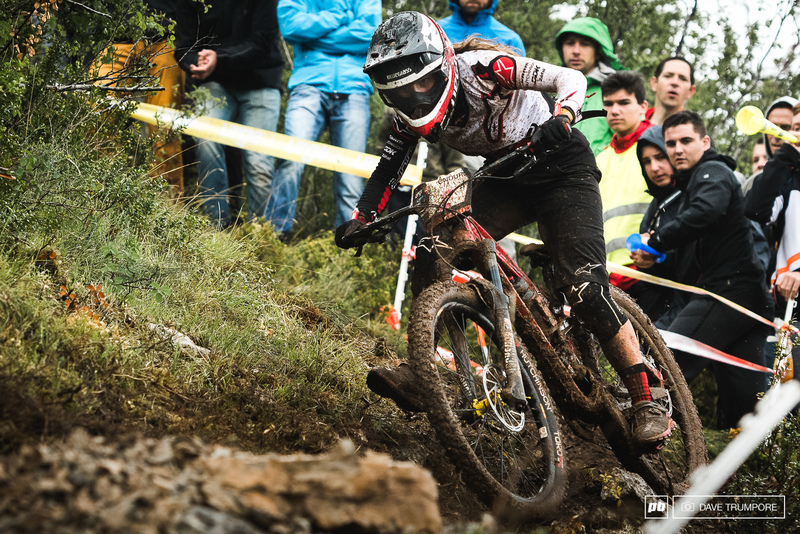 A flat put her out of the running for the podium and cost her three places in the overall. Her sights are now set on regaining ground in Aspen. One last check to be sure Oton and Galy are mechanically sound. 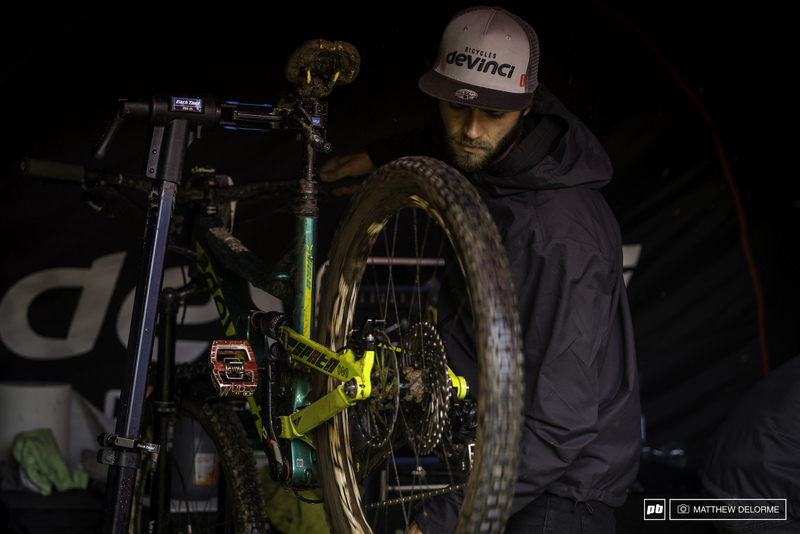 Shawn Huges goes over Richie Rude's bike one last time before heading to stage nine. One stage to go on a wheel that's just hanging on. 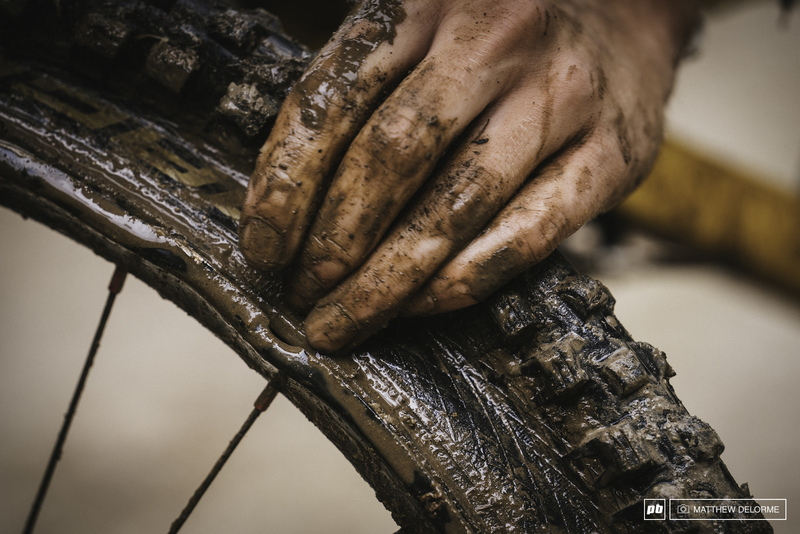 A bad situation gets worse when air goes everywhere but in the tire. No surface was free from the fine mud and the muck. Bikes were carrying a little extra weight by days end. Dimitri Tordo had a solid weekend finishing eighth in the overall after a crash that cost him four places today. Alex Cure on the ride of his life. Alex finished second today and was flirting with the lead all weekend. 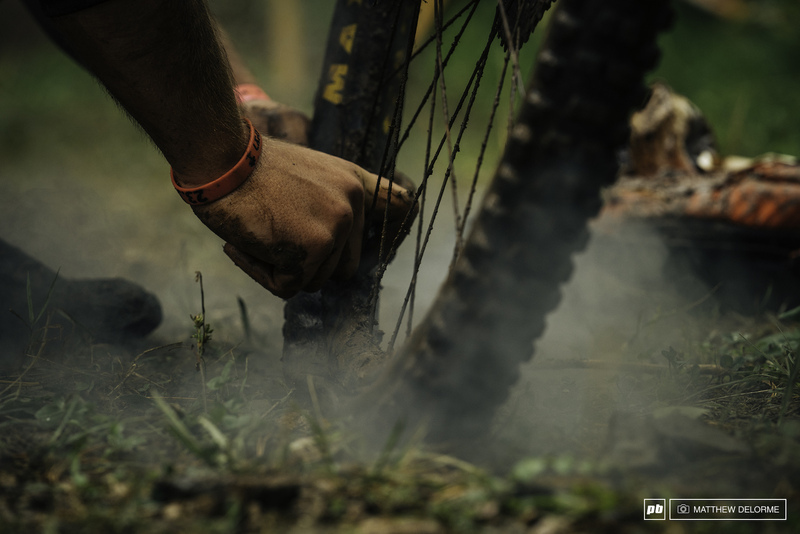 A broken chain on the final stage of the day added insult to injury for Mark Scott as he was forced to speed tuck the final minute of the track. Jesse Melamed sprints the final one hundred meters to the finish line. After illness threatened to derail his weekend, Jesse put on his game face and was able to salvage some good points for the overall series. 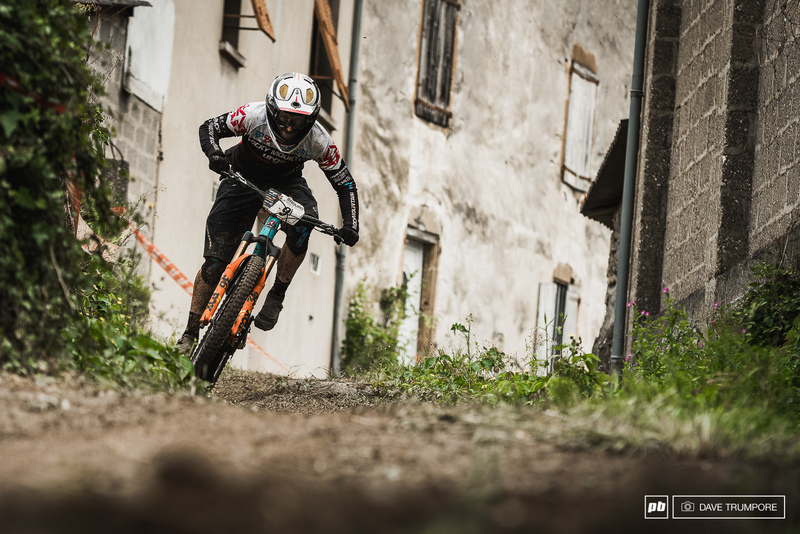 On a mission, Adrien Dailly smashed out top performances stage after stage and now leads the overall. After battling inside the top 10 on day one, Damian Oton went all out on the second day of racing to pull himself all the way back to 3rd. 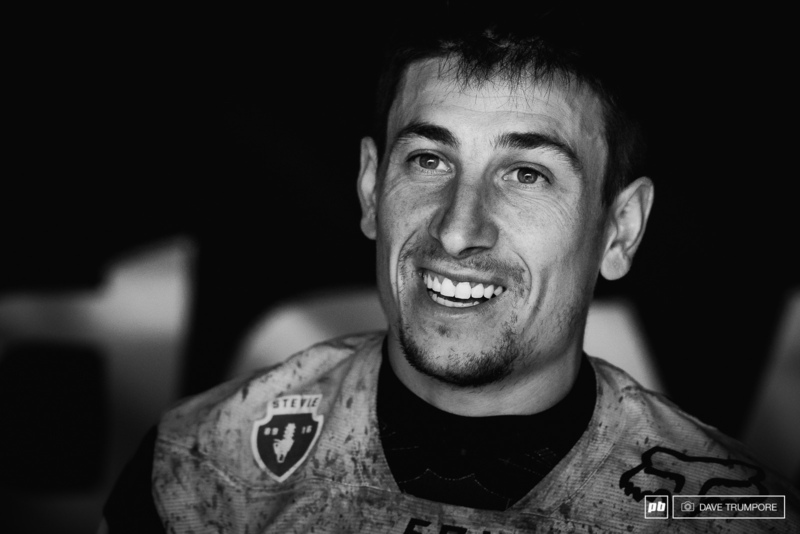 Exhausted but stoked on 4th for Florian Nicoli. 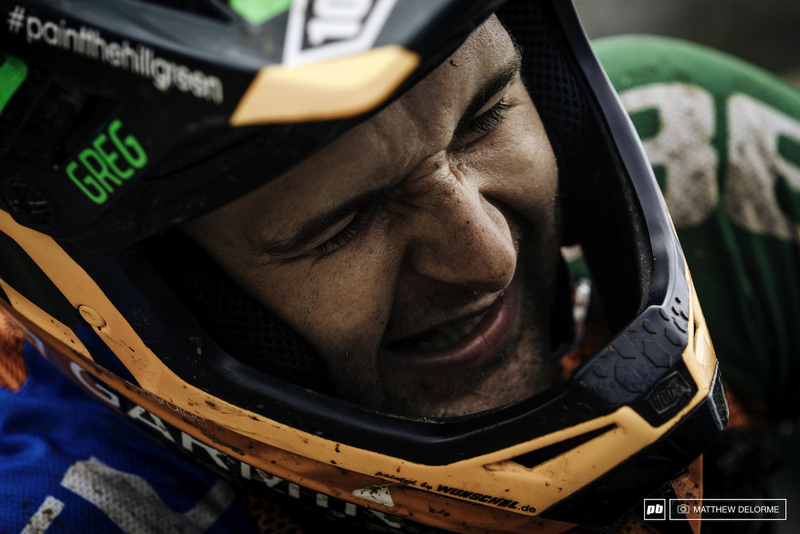 So close to the podium today for Theo Galy until everything came undone on the final stage. By winning his third round of the year, Adrien Dailly now leads the overall series with three rounds to go. 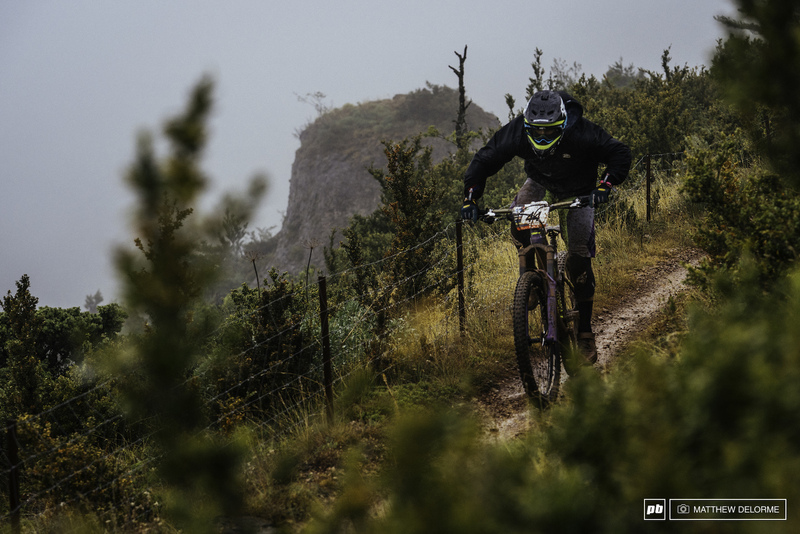 It was a hard fought battle against the elements for Katy Winton in Millau, which ended with a flat front tire on the final stage of the day. 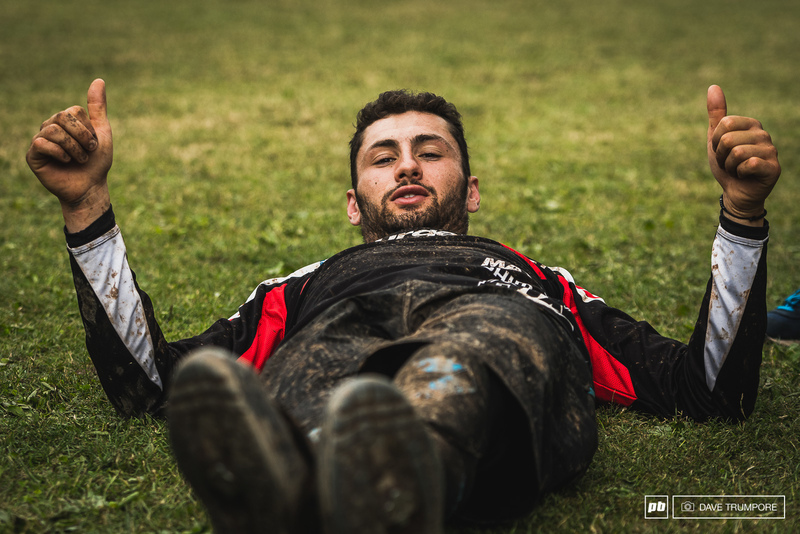 Jesse Melamed dug hard this weekend and rode to seventh despite being sick. 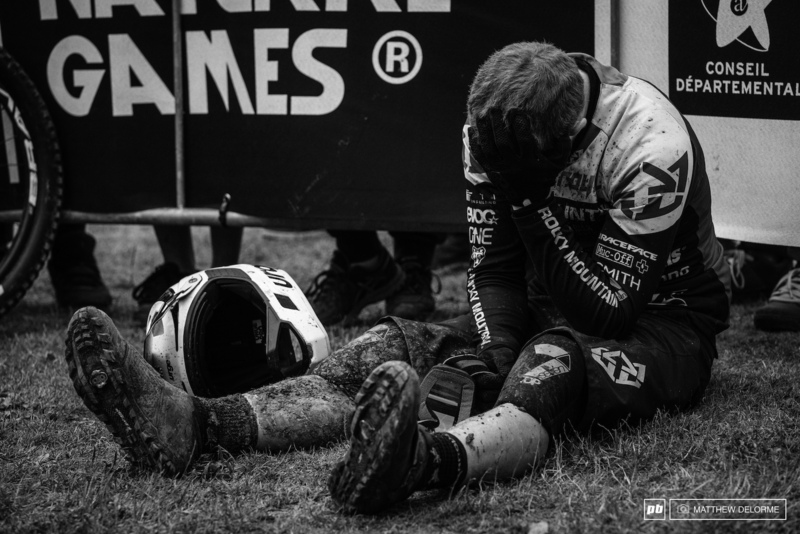 Florian Nicolai wincing in pain at the finish line. After four days of rain and mud, it's time to go home and scrub the dirt out. 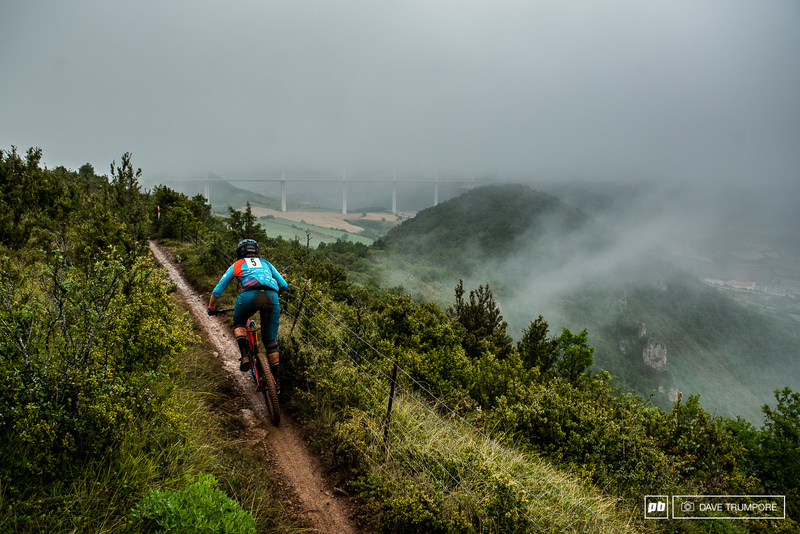 The fastest women in Millau. 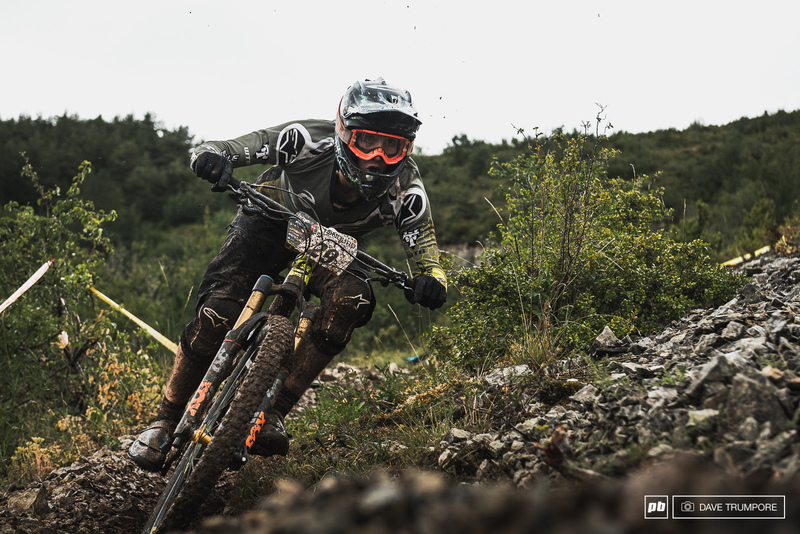 Rocky Mountain, Ibis, and BH Bikes take the top three spots this weekend in the team competition. 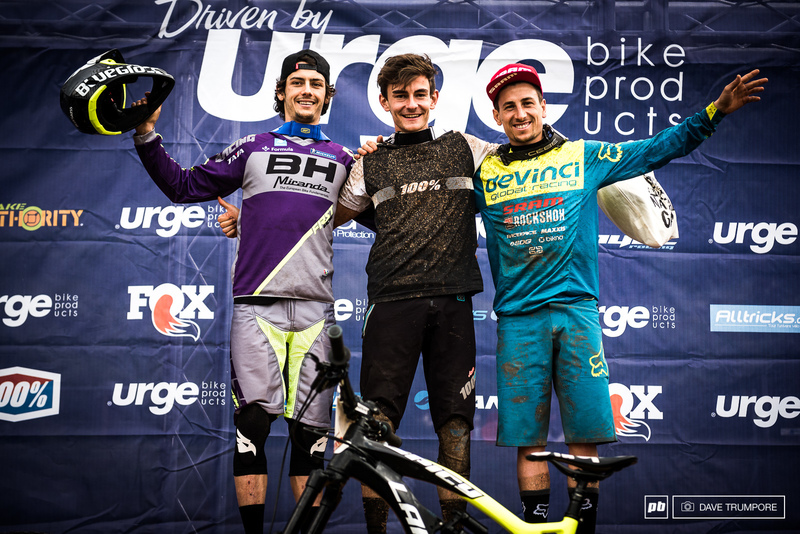 Adrien Dailly, Alex Cure and Damian Oton round out the Men's podium. 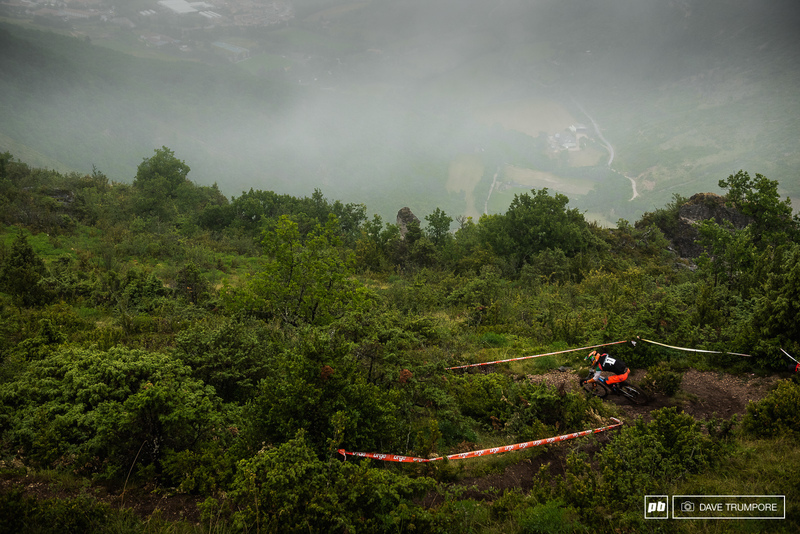 This is what pro mountain bike races should be. Absolute hell that no one at less than the top of the sport dare even tangle with. 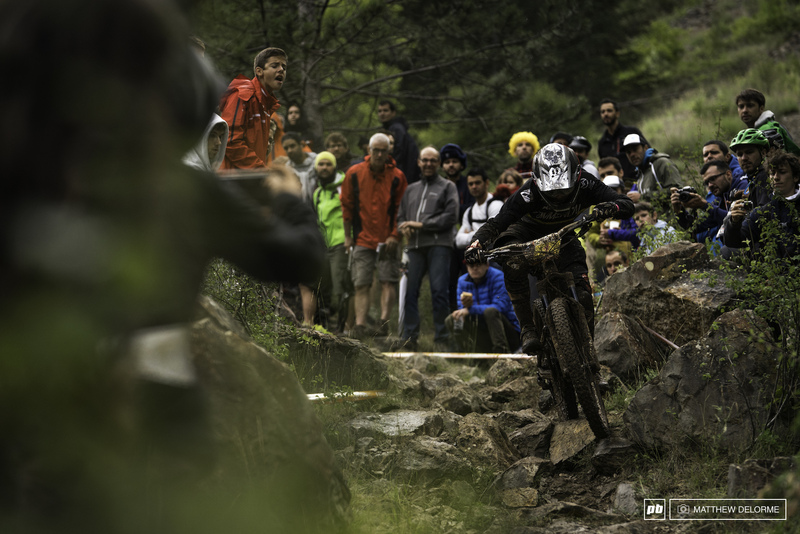 Bravo EWS for delivering the burliest racing in the sport. 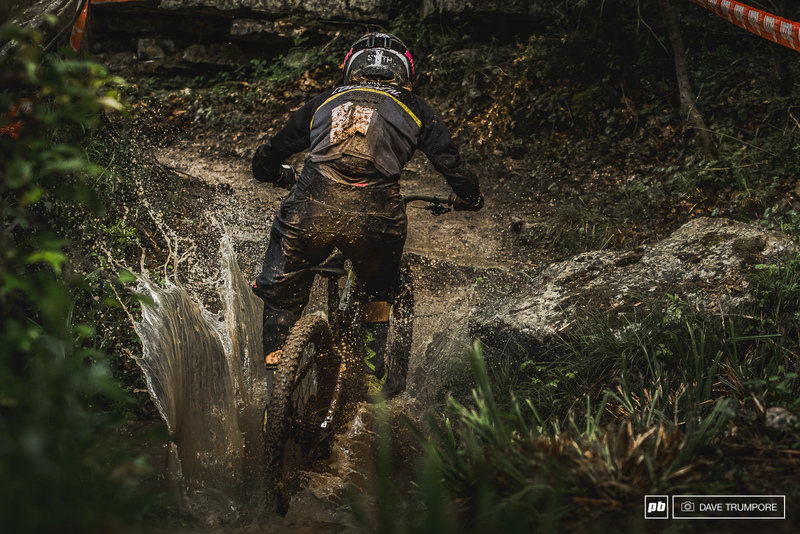 EWS please come to Finale Ligure earlier than scheduled, we are in the middle of a drought. 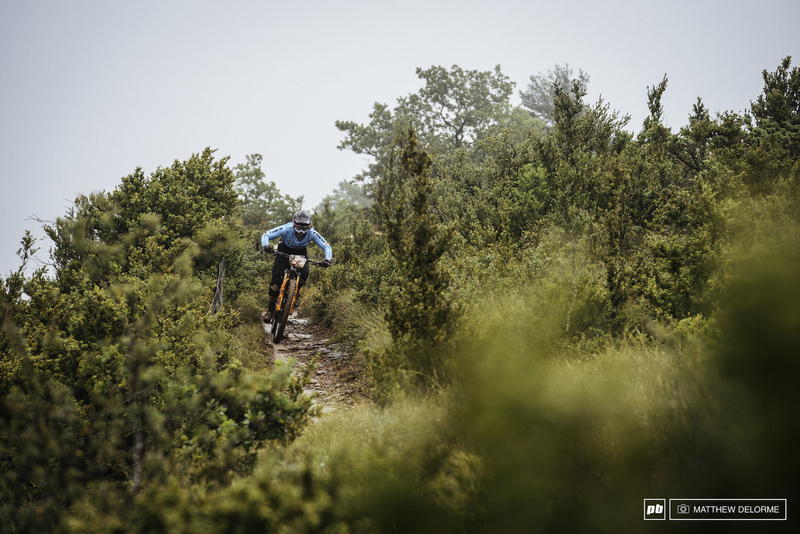 That rockgarden is the France version of a flowtrail. That's my kind of flow trail. 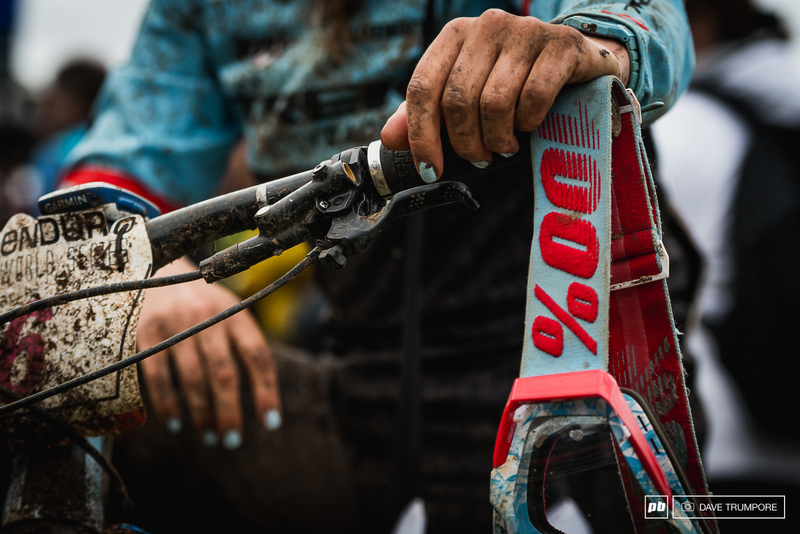 Katy's extreme full enduro kit: matching baby blue nail polish. Yeah I'd like some clarification on that comment. Are we talking riders just literally dropping rubbish willy nilly or dropping drinks bottles at the start of stages? @kiksy: you are not allowed to drop or pick up any food,drink or equipment etc around the course. 5 min penalty in the rules. Yeah it's a common problem in Europe (don't know in the US), on most XC&Enduro (also trail running) races riders are just eating their bars and throwing them away in nature. So now in France, at almost every race if you're caught littering you get a penalty or disqualification. Those last few photos... pure devastation. The place looks like a war zone. Dailly is phenomenal. 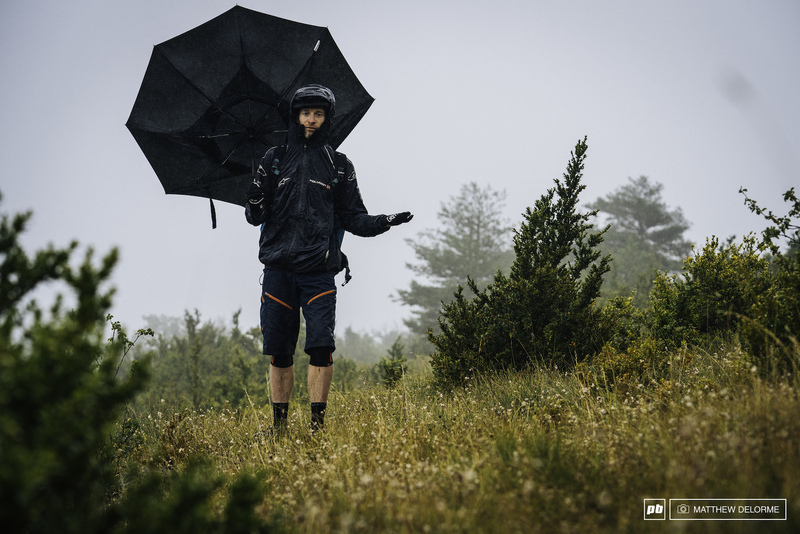 He could still be racing juniors and he's winning it all in the most challenging conditions possible. What's the overall looking like now? 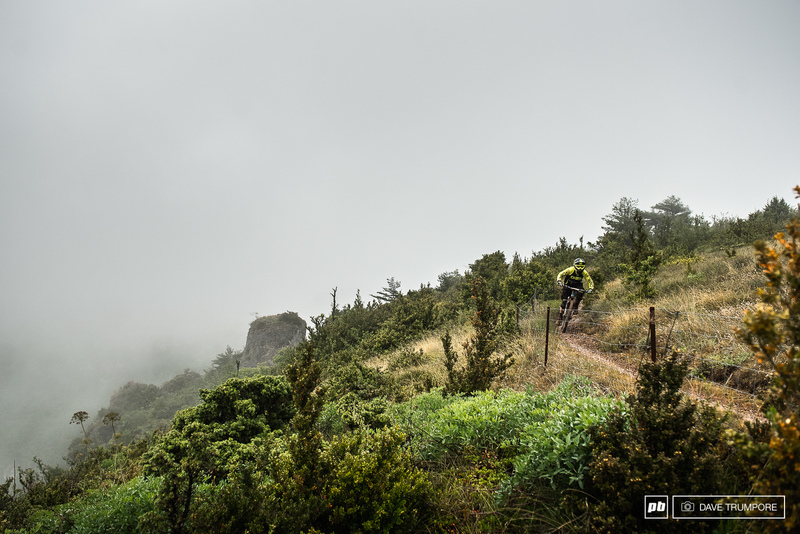 How about we have an EWS stop in California? Almost a 100% guarantee of dry conditions in the summer. What actually happened to Rude? Must have been more than a tire....did the wheel go? I believe he hit a tree on day one. The wet/mud conditions don't seem to favor him either. Wonder who's wheel the middle pic was? Wheel held up and he won the last stage (also won the second stage). 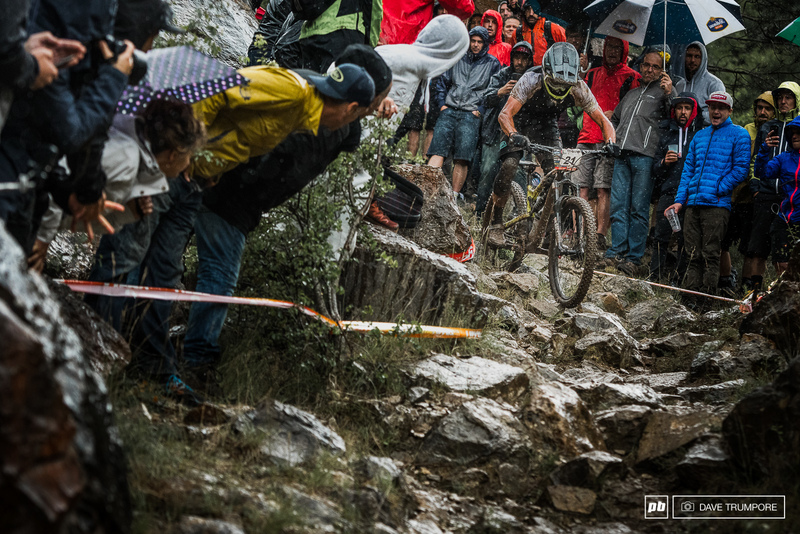 Definitely not his weekend, but two stage wins at an EWS would be a career highlight for many. Only 9" of rain in Moab. All. Year. Long. #justsayin - but man could we use some now..
Cecile Ravanel pic, now we know how Red Sea was parted for Israelites to cross over. I understand why riders aren't using tearaways, but why not the rolling systems? 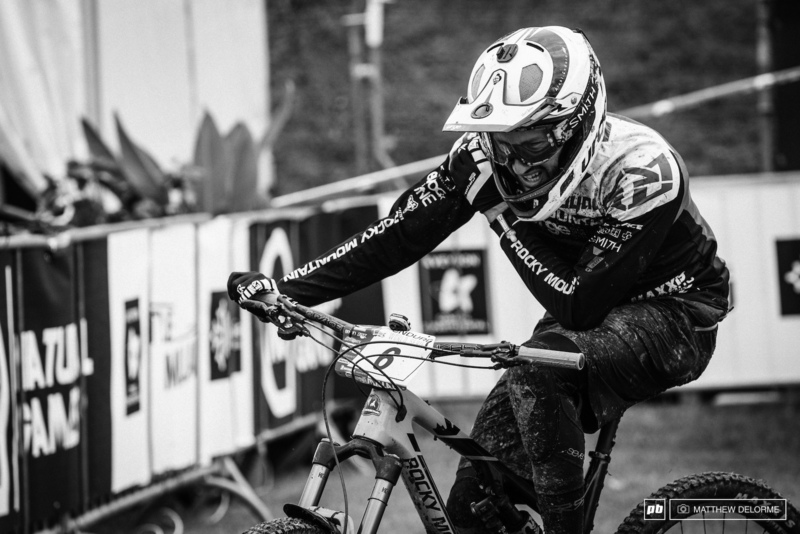 When we see yeti commencal etc etc pics on this post and not a single pic of the wining bike!! Hahaha well you obviously have a theory as you are insuinatung and accusing things that are pretty silly. It's a podium photo with the three top riders filling the frame of the shot. It just so happens to frame it that way the bike is half in the photo half out. Nothing more nothing less. 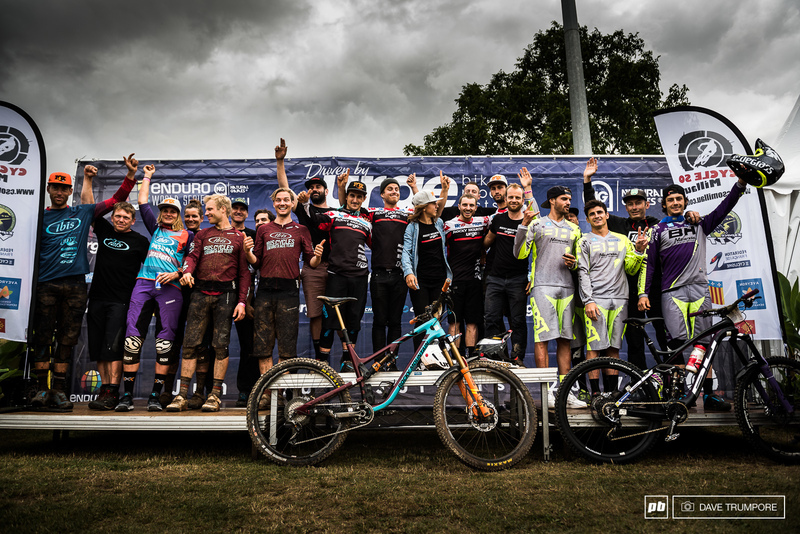 The Women's podium shot is wide and the men's tight, simply so we can post two different photos in these stories for the sake of variety, nothing more nothing less. Pretty basic concept here. Where's the Yeti commercial? 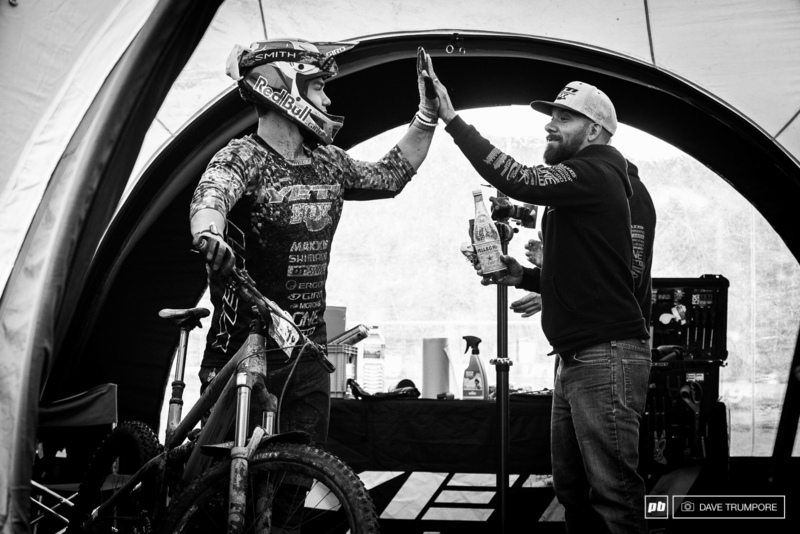 I just see a shot of the defending works Champ high fiving his mechanic and having his bike worked on. He's depending two time works Champ and is always part of the story for that reason regardless of results. That's kind of how editorial works. 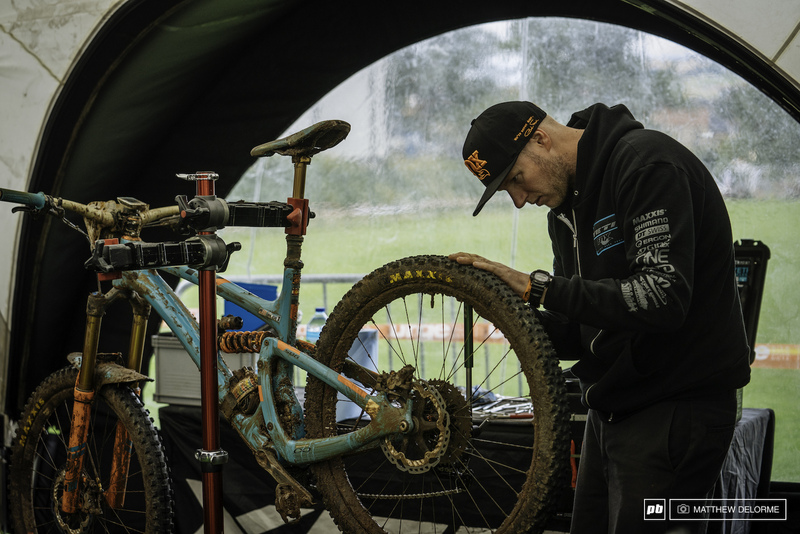 Perhaps if Lapierre had a pit setup and didn't work out of a car on the far end of the carpark there might be a photos of Adrien's bike being worked on too just as there's one of Richie's and Damien Otons in this post. There are however two action shots of Daily and his entire bike is visable for you to look at (notice there is no action shot of Richie which you'd probably also try to call a Yeti commercial). 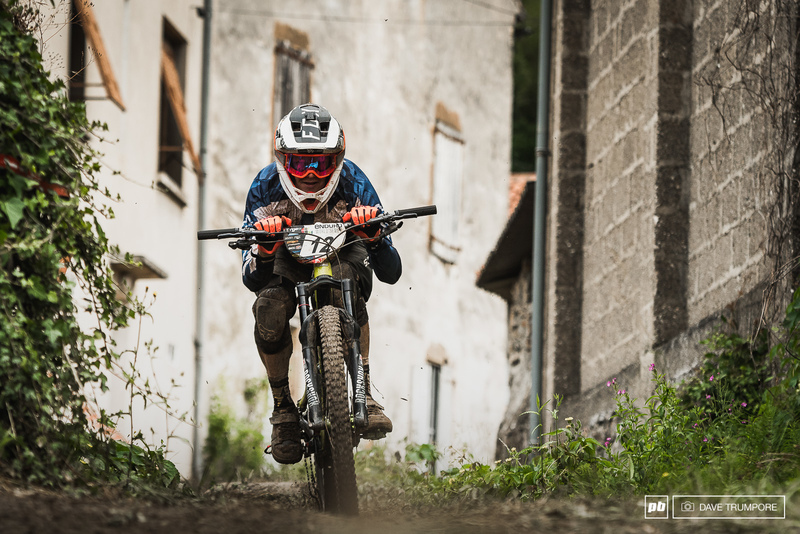 We've featured winning bike shots of Adrien and his Lapierre at previous rounds so I'm still confused why you think we are deliberately not showing photos of his bike .... That's just nonsense. @davetrumpore: Its a shame you have to defend yourself from such a stupid comment. 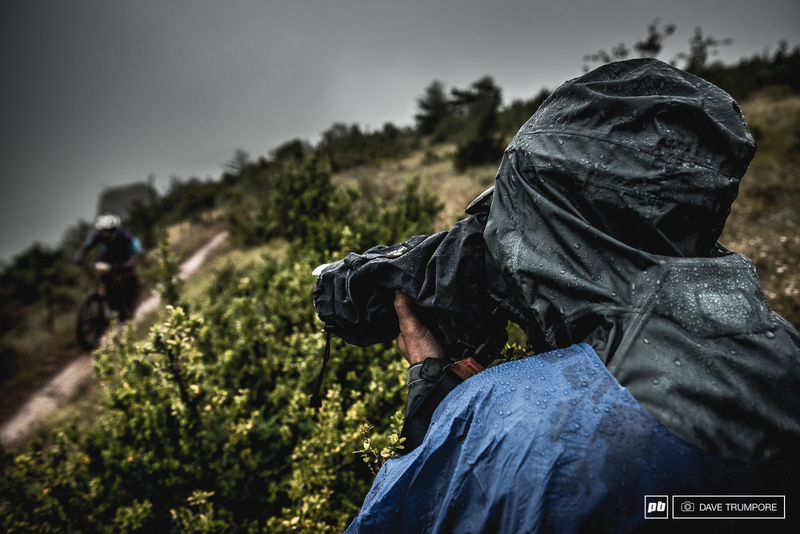 Awesome work on the photos, you snappers must be even more sick of working in this weather than the riders! Does anybody have fun in those conditions? What does it mean when a riders time is underlined in the final sheets? Petfect podium steezeez for both men and women! 2nd and 3rd embrace 1st, none of the silly 2 hands up stuff. 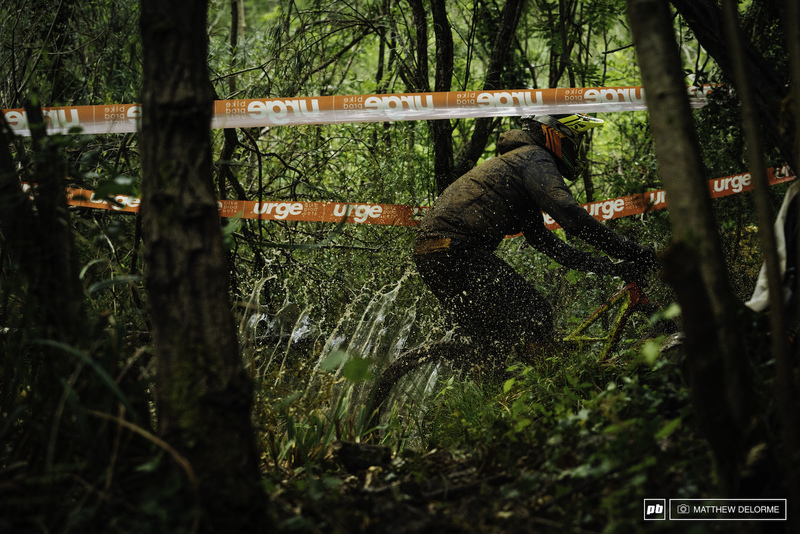 Maybe if the EWS had more rounds in North America they might actually escape the wet conditions. We had a huge heat wave the three last weeks (really hotter than regular at this season) and the weather forecast is great for the coming weeks... Happy to share the EWS with your continent, it comes with the clouds. Pb as usual hide pics of the lapierre wining bike As a lapierre fan its hard no to note that!! ??? Elaborate in this consiracy theory please... It's one I've not heard before. But it sounds properly entertaining. @machuqueiro - tinfoil hat time is it? @davetrumpore: Come on dave, we all know you hate Lapierre and are on a one-man mission to ruin the brand via the medium of photography! Probably coincidence, although I am happy about it. Nothing against Lapierre but that thing is hideous!! @Kiwiplague: haha i did not know a meaning off that!! Yes I usually use at least two when i left my cave / shelter ??????? ?